On a drizzly day late last week, I took my five-year-old son to the surf shop, where I came across some white braided rope bracelets, the kind I bought and wore every summer when I was a kid. With every dip in the ocean and water-skiing loop around the bay, the bracelet would slowly shrink to fit my wrist, so that by summer's end it was impossible to slip off my hand. Just the way I liked it. I offered to buy a rope bracelet for my son, telling him how much I loved wearing one every summer, explaining how it aged and frayed with the sun and salt. Nope, he didn't want it. Not even a little bit. Instead, he asked for a red frisbee. 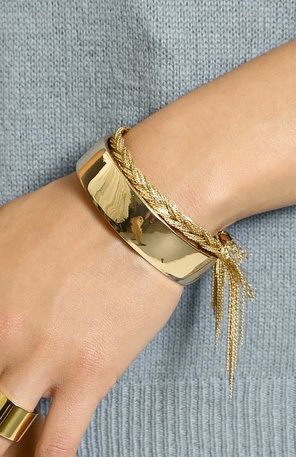 Fast forward to this morning, when I spotted this braided bracelet, with undone tasseled ends, glinty, gold and grown-up. My new version of the rope bracelet. I have a feeling it will be restocked within days...it's a good one! You can purchase directly from Shashi website. Also in white gold and a necklace!